If they sold I heart Ottolenghi t-shirts I’d be queuing up for one. Israeli born Yottam Ottolenghi is one of the hottest chefs at the moment and it’s no wonder as his recipes and approach to food and flavours is like a breath of fresh air. There hasn’t been a dish I’ve tried out of Ottolenghi’s numerous cook books that hasn’t been spectacular. This is the first one of his recipes I’m posting as I normally make his dishes for our weekly family nights and there’s just too much chaos in my small kitchen to try and capture any worthwhile photos. I loved how easy this dish was to throw together, perfect for a mid week meal but special enough for company. This dish has a wonderful balance of flavours and in classic Ottolenghi style the hazelnut, honey and rosewater paste, which is added to towards the end of the cooking time, gives a wonderful and unexpected texture and flavour hit that transforms the whole dish. 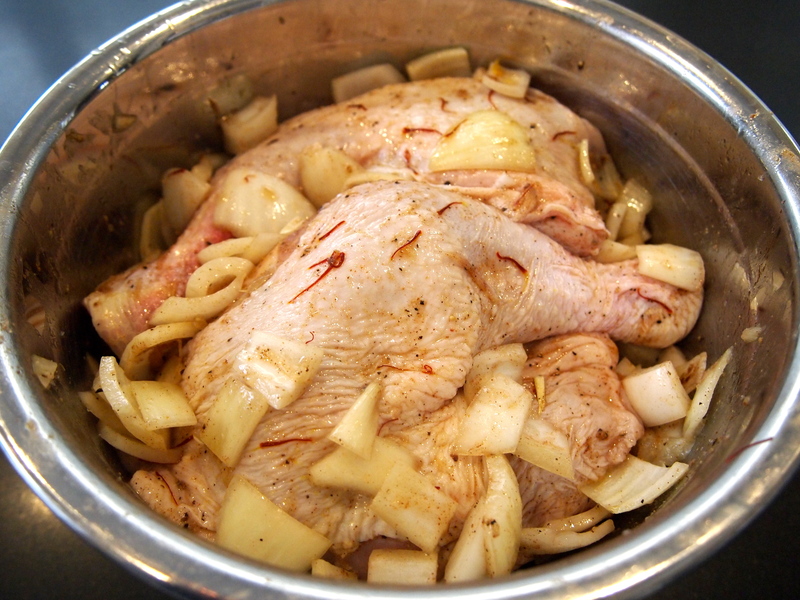 In a large bowl, mix the chicken pieces with the onions, olive oil, ginger, cinnamon, saffron, lemon juice, water, salt, and pepper. Leave to marinate for at least an hour, or overnight in the fridge. Preheat the oven to 200C. Spread the hazelnuts out on a baking sheet and toast for 10 minutes, until lightly browned. Chop coarsely and set aside. Transfer the chicken and marinade to a baking tray large enough to accommodate everything comfortably. 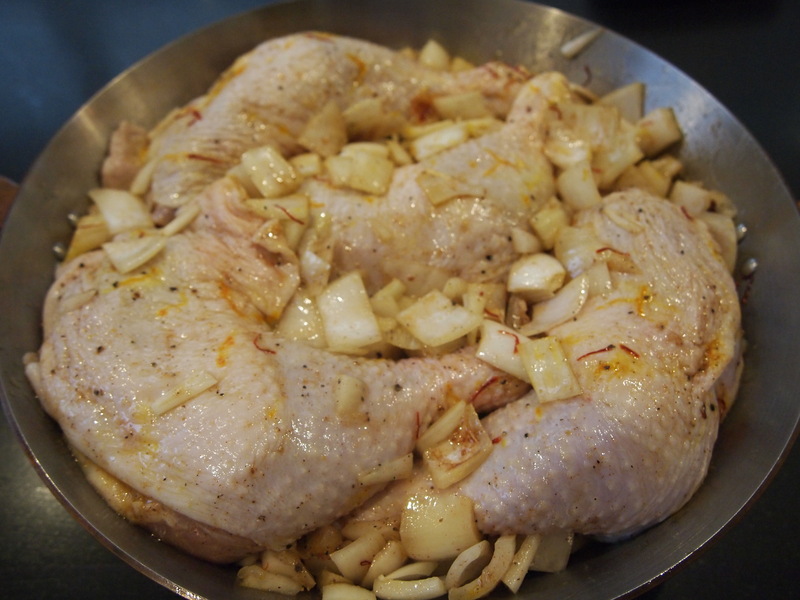 Arrange the chicken pieces skin side up and put the pan in the oven. Ottolenghi says to cook the chicken for abut 35 minutes but I didn’t find that to be enough time and preferred to keep my chicken in for about 45 minutes until it was a nice golden brown. 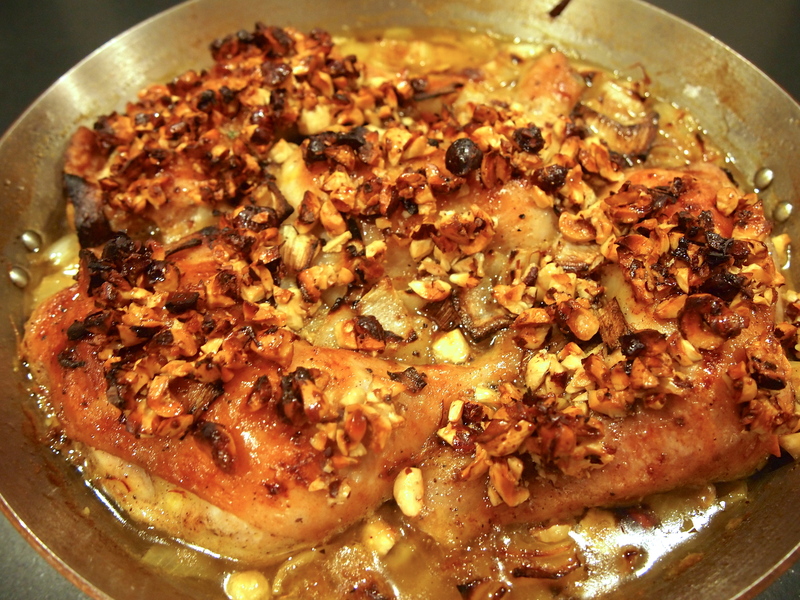 While the chicken is roasting, mix the honey, rose water, and nuts together to make a rough paste. 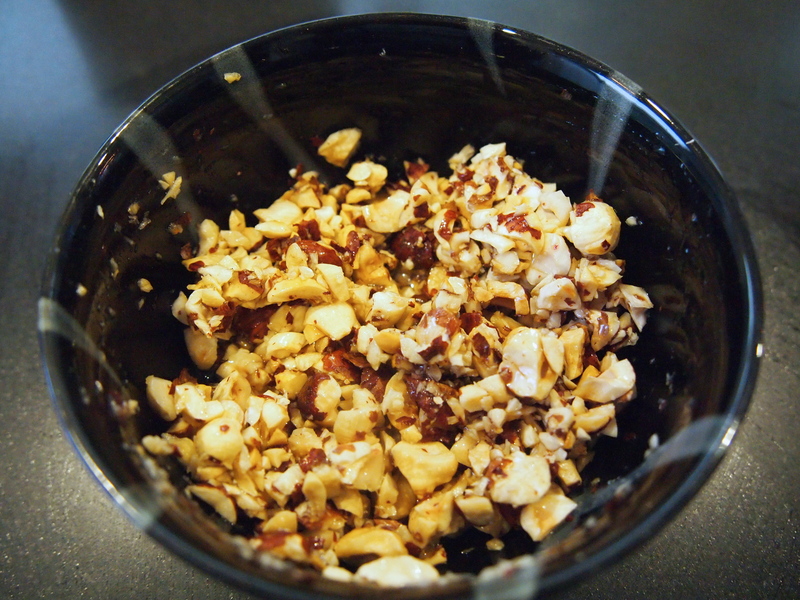 Remove the chicken from the oven, spoon a generous amount of nuts paste onto each piece, and spread it to cover. 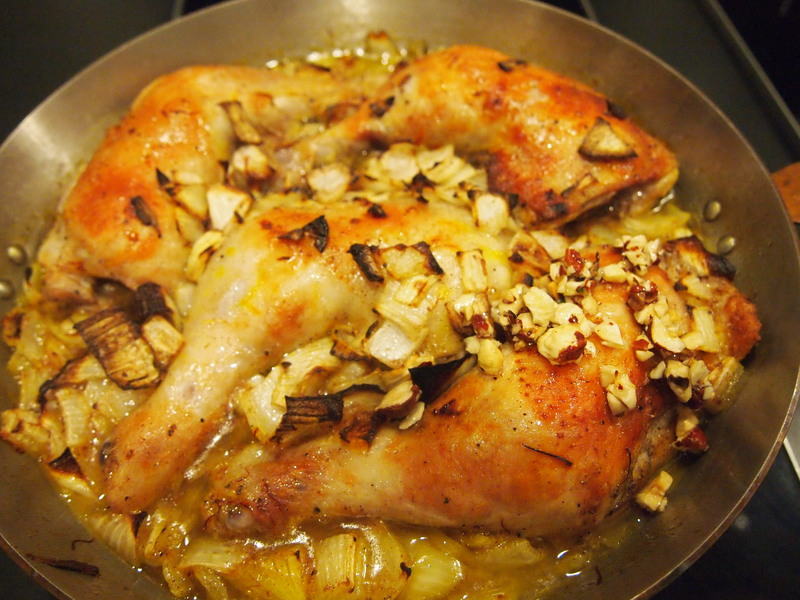 Return to the oven for 10 minutes, until the chicken is cooked through and the nuts are golden brown. 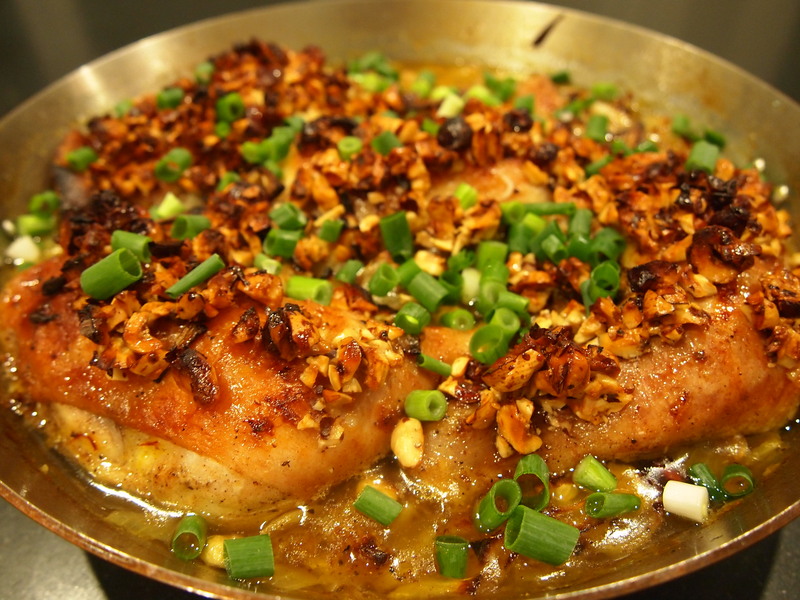 Transfer the chicken to a serving dish and garnish with the chopped green onions.